Start your tour in the picturesque village of Paisley and grab a hot cup of java before you hit the road. Cruise down to the little community of Lucknow, where you will find Armstrong’s Bakery, the perfect place to stop for a fruit tart and to stretch your legs. Continue over to Teeswater and park your bike at the Gay Lea County Store, a great little shop showcasing local products. Ride over to Mildmay where you’ll want to stop at one of the delicious restaurants for a bite to eat or even a delicious butter tart at Harley’s Pub and Perk. Tour back to Walkerton where you will find a number of unique parks, shops and restaurants that may catch your attention. When your ride over one of their bridges in the downtown core, make sure to take note of the mighty Saugeen River flowing below. 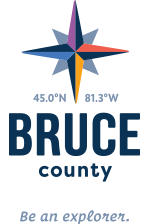 End your tour by riding over to the small town of Chesley, where the main attraction is the Big Bruce statue, a 15 foot high statue of a bull representing the amazing beef produced in Bruce County. You’ll want to take a picture of your bikes beside this big guy! While you are in Chesley, park your bike and take a walk in Krug Memorial Park.